Are we an invasive species? In a high-rise in Malaysia’s capital in 1999, a group of scientists — convened by the International Union for Conservation of Nature to designate “100 of the World’s Worst Invasive Alien Species” — asked themselves this very question. “Every single person in the room agreed, humans are the worst invasive species,” said Daniel Simberloff, a professor of environmental science at the University of Tennessee, who was at the meeting. “But the I.U.C.N. disagreed.” Homo sapiens, which has colonized and deforested much of the Earth and pumped enough carbon dioxide into the atmosphere to change its climate, was excluded from the list. While the meaning of “invasive” has been the subject of some debate, the generally accepted definition is a plant, animal or other organism that, aided by humans, has recently moved to a place where it is nonnative, to detrimental effect. Humans don’t fit that definition, said Piero Genovesi, chairman of the I.U.C.N.’s invasive species group, because they are the ones doing the moving. A more useful way to think about ourselves, Dr. Genovesi said, is as the drivers of every problem conservation tries to remedy. Despite the lack of a single definition, however, we can pull from these definitions some general aspects of an invasive species and apply those to Homo sapiens. An invasive species is widespread: Humans, which can be found on every continent, floating on every ocean and even circling the skies above certainly meet this aspect of invasiveness. An invasive species has to be a non-native: Humans had colonized every continent but Antarctica by about 15,000 years ago. Sure, we’ve done some rearranging of populations since then and had an explosion in population size, but we’re a native species. 3) An invasive species is introduced to a new habitat: Humans move themselves; there is no outside entity facilitating their spread. 4) An invasive species had adverse effects on its new habitat and/or on human health: Humans meet this part of the definition in too many ways to count. Verdict: We’re not an invasive species, though we’re certainly doing harm to the world around us. 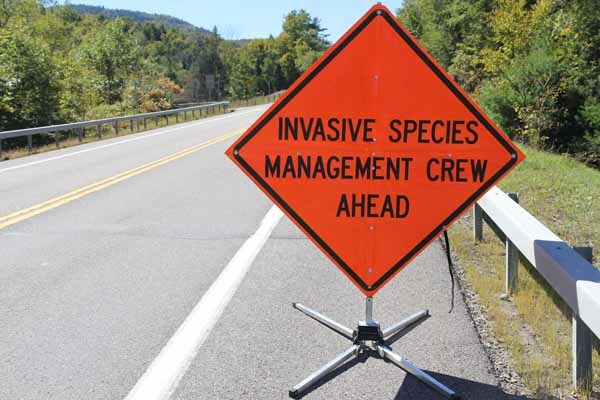 If you think about it, all of the harm done by invasive species is by definition our collective faults; some kind of human action led to that species being in a new place where it then causes some harm. And so I’m not at all astonished to find people arguing that we’re the worst invasive species of them all. I fully agree with Ms. Zielinski: based on our fully human-centric definition of invasive species, the term cannot apply to us while we are on this planet. We can, however, become an invasive species via our space explorations and are taking some precautions to minimize that risk. A good example of this is the Cassini spacecraft’s deliberate crash into Saturn’s atmosphere in September 2017 to prevent contamination of any future efforts to find life in space. All the damage that humans are causing to the physical environment does not “justify” labeling us as foreign invaders. This planet is our home. It is also the only home of any other life form that we know. We are all “competing” for dominance here. These events are much better framed as collective suicides or self-inflicted genocides. I am teaching Cosmology as an advanced General Education course at Brooklyn College. 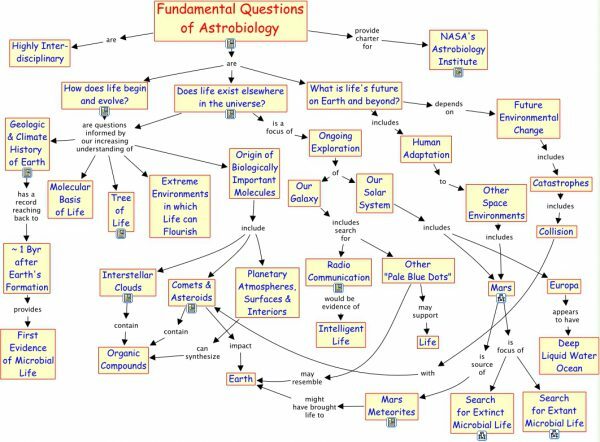 The syllabus covers our attempts to find extraterrestrial life, an area known as Astrobiology. Figure 1 shows the various areas of inquiry that are being considered as part of this effort. Closer inspection of this figure reveals that environmental issues play a key role. For instance, “what is life’s future on Earth and beyond?” and “Future Environmental Change.” In the latter category we see “Catastrophes” – but this entry only refers to collisions of various kinds with space objects, not with the self-destruction of Earth’s native life forms. I have covered self-destruction in specific blogs such as “Nuclear Winter” (July 9, 2013) as well as throughout the CCF blog (July 9, 2013 estimated the energy release of climate change as a multiple of that produced by the Hiroshima bombing). This entry was posted in Anthropogenic, Climate Change, Sustainability and tagged Adaptation, alien, Anthropocene, Astrobiology, Biology, cassini, catastrophe, Climate Change, Climate Change Denial, Climate Change Deniers, Climate Skeptics, CO2 emissions, Collective Suicide, contaminate, cosmology, Emissions, Energy, energy transition, Environment, environmental, environmentalist, evolution, extraterrestrial, foreign, Fossil Fuels, Future, Genocide, Global Population, global suicide, Global Warming, greenhouse gas, Health, Hiroshima, homo sapien, human, human environment, human-centric, invade, invader, invasive, IUCN, life, Mars, meteorite, microbial life, NASA, native, non-native, Nuclear Winter, saturn, Science, Self Inflicted Genocide, Smithsonian, species, Sustainability, World Population. Bookmark the permalink.